Concentrated laundry destainer for use on whites and colorfast linens. Excellent destaining. Extends linen use life. SureConnect, no contact, no spills, enhances safety. Highly concentrated optimum bleaching. 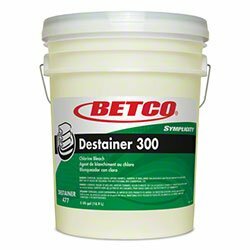 If you have any questions about this product by SYMPLICITY DESTAINER 300, contact us by completing and submitting the form below. If you are looking for a specif part number, please include it with your message.